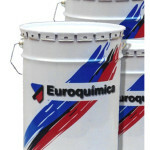 Aliphatic acrylic Polyurethane Enamel, high quality, highly resistant, light-fast and stable to weathering. Excellent resistance to abrasion, impact and to fuels or oils. Classed Bs2d0 according to Euroclasses of reaction against fire, on support not flammable.